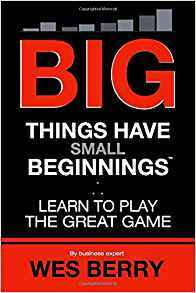 A life-changing and highly motivational book! Ronald S. Kaiser, Ph.D., ABPP, is a Licensed Psychologist in Philadelphia, successful author, and owner of The Mental Health Gym website. Now aged 80, he has used his decades of life experience as a school counselor, then in the community and health sectors, to write this life changing and highly motivational book. He firmly believes that we can take charge of our destiny, and we have the choice as to whether we grow old or rejuvenage. 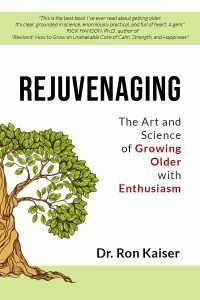 The keys to rejuvenaging are explained clearly throughout the book, and although it is accepted that some elements are outside our control, he firmly believes that if you follow his “Goal-Achieving Psychology,” or GAP, it will help you bridge the gap between thinking and doing, which in turn will make you happier, more productive, and enable you to take control of your aging process in a positive manner. So how do we do this? Well by adopting the ‘P’ personality, which is explained clearly in this book. It has to be mentioned that this is no end-of-life book. Although inspirational for the elderly, it has been written so that anyone can plan for their future in a positive way, whatever their age, through learning to become personal goal-driven, proactive, positive, persistent, passionate, and playful. Whether you want to stay working, or retire, it will empower you to rediscover (or newly discover for some) your sense of fun, help you to understand how to set personal goals, encourage you to use the powers of positive thinking, be passionate, be persistent, and be proactive. Planning for your future psychologically is just as important as financially, and this book shows you how. Diet, and the benefits of exercise, learning new skills, exploring new avenues and experiences, living life to the full, keeping ourselves mentally stimulated and interested in the world around us—all these are things we can do to improve our life now, and for the future. Whether you want to remain working, or retire, you will discover how to make the most of your senior years. After all, your health and planning for your future is just as important psychologically as it is financially. 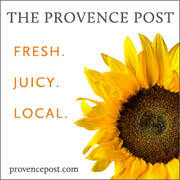 So what are you waiting for, get your copy, and start rejuvenaging now! Lovers of fantasy will be swept away by the story and characters in this amazing new book by Dennis Meredith, an author who has spent a lifetime working in science communication at some of the country’s leading research universities and has written many articles on science and engineering. Among his numerous achievements are a B.S. degree in chemistry from the University of Texas, and a M.S. in biochemistry and science writing from the University of Wisconsin. 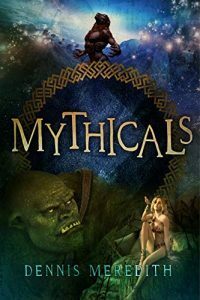 He has brought together in this amazing story a cornucopia of mythical creatures and fairy-tale characters, fairies, pixies and angels, ogres, werewolves and many more. Each distinct species has its own unique characteristics, and what’s more the reader really begins to understand this as they take their place in the story. However, one of the main characters is jobless would-be journalist Jack March, who true to journalistic form just cannot let go of the promise of a good story. You see Jack, arriving home in a drunken stupor is sure he saw a fairy in his bedroom. Undaunted by the possibility that he was hallucinating, he is resolute in his pedantic determination to seek out the truth about the fairy’s existence at whatever cost. His stubbornness leads to him discovering that all is not what it first appears. There is a world he never would have believed could have existed within his own, and his life is turned upside down when it is revealed to him and he discovers that the people he sees every day, in all walks of life, could be the strange creatures of myths and legends who have been banished to his world and wear flesh-suits to look human. These creatures are transported through wormholes which are controlled by Wardens and work in both directions as Jack discovers when he is sent through one. He is called upon to do his bit however, when a terrible plot is discovered to eradicate the species in order to save the planet, and Jack finds himself revealing the creatures’ real forms to an unsuspecting world, and taking part in a battle to save the planet. Fast paced, exciting, this incredible story is sure to become a firm favourite with lovers of fantasy and fairy tales. With Christmas coming I was excited to find this delightfully enchanting seasonal story in the Super Speed Sam series of children’s books to read to my granddaughter. Being animal lovers we were immediately drawn to the lovable character of Sam the Basset Hound, and as soon as we turned the first page we knew that we were in for a treat. In this colourfully illustrated story we are taken back in time to the Brockman families Christmas Eve a long time ago, back through generations of Basset Hounds to the very first Super Speed Sam (and yes he was called Sam too,) and we discover why that Sam gained his super powers. In the North Pole, after a busy year, Mother Christmas, Santa, the elves and the reindeer are ready for another Christmas Eve journey visiting all the good boys and girls. Did you ever wonder why this magical event takes place? Well, in this enchanting book not only will you will find out, but you will also discover just what big responsibilities everybody has, both at Santa’s home base, and on the sleigh, to make sure everything runs smoothly on that special night. Everything until that time is going well, and Santa is on schedule. However as he goes down the Brockman chimney, something unexpected happens, which causes great dismay to Santa, a lot of worry for Mother Christmas, and danger for the reindeer. But what is it? Well, all I can say is that the real hero of the story, is Super Speed Sam, and that night he is given a very special gift which will be passed down through all the future generations in his special Basset Hound line. In our household this book is definitely set to be a Christmas classic for the grandchildren, to sit on the bookshelf alongside their parents, and my immortal favourite poem ‘T’was the Night Before Christmas’ by Clement Clarke Moore, where for years children, and the author I suspect, originally discovered the names of all Santa’s magical reindeers. After enjoying this captivating story, my granddaughter and I are looking forward to exploring the rest of this delightful series of children’s books. 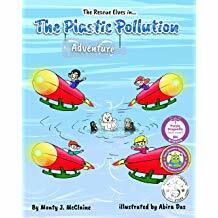 This book must be the best way ever to get the message across to children about the dangers of plastic to wildlife, the amount of items of rubbish it accumulates, where it is dumped, and also how important recycling is. 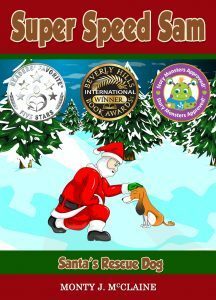 I recently read Santa’s Rescue Dog, Super Speed Sam, Book 5, by the same author to my granddaughter and we enjoyed it so much that this story caught my eye. You see, it is in Santa’s Rescue Dog that we first meet the relves. These are special rescue elves tasked with rescuing Santa, should he have a catastrophe on Christmas Eve, and their names are Sparkle, Holly, Jack and Charlie. Of course, everyone knows to be good at rescue like Firemen you have to practice, and the relves do the same. Mrs. Claus sends them, on special missions around the world throughout the year, just to keep them on their toes. Their mission this time is to go to the beautiful Pacific Ocean and explore it, and the creatures which live near and in it. After all, you never know, one day Santa’s sleigh could break down going over the sea and they would have to know what to do if it was stuck under the water, wouldn’t they? Now the Pacific Ocean is so different from the North Pole that the relves didn’t know what to expect, but being relves they are well prepared for anything. However, they can’t believe their eyes when they arrive and see a mysterious grey island. As they draw nearer they realise that it is made from all things plastic. “How strange, I wonder where all this came from,” they ask themselves as they climb over it. Then suddenly they hear cries for help, and find some very special baby creatures in real distress. Luckily for them, rescue is what the relves do. The incident makes the relves wonder how such a terrible thing could be in the middle of a lovely ocean. However, all is explained when the babies’ mommies arrive they tell them what is happening to the environment and our beautiful planet. Something must be done, the relves decide. So they demonstrate to the reader what can be done, what a difference recycling can make, and how everyone can play their part. This beautifully illustrated story was listened to avidly by my two grandsons and was the perfect way to explain to them that the environment is everyone’s responsibility, the dangers caused to wildlife by rubbish, and how important it is to take care of our world. I think this book should be read to all children wherever in the world they live, the message it contains is so important and it will empower them with the knowledge that ‘they’ can make a difference! I just loved this book! In it I was transported from the first page, with American Jacoby Pines and his fiancée Claire, from my adoptive country of France into beautiful Italy. The author, Andrew Cotto, who lives in Brooklyn, is a writer whose articles have appeared in many national journals. He is also a teacher and has taught composition courses and creative writing workshops in New York City. This Italian adventure is his third novel and in it his wonderful storytelling abilities shine through. When the story begins the disheartened Jacoby is unemployed following an unfortunate incident at work, and he finds himself soaking up the food, culture and customs of Italy with his accomplished travel writer fiancée Claire. Arriving in France, together they travel along the French Riviera, then onto the eye-opening Italian Autostrada, enjoying the marvellous coastal views, and staying at a beautiful coastal hotel. Then the next day they head inland to the villa they have rented, in the hills above Florence, for the coming year. However, although they are primarily in the region for Claire’s assignment for the prestigious Haxby’s Travel Guide, Jacoby has his own agenda. Having never known his mother, he discovered upon the death of his father a box containing a photograph of a woman standing on a great lawn, and written on the back is ‘Villa Floria-Zanobini 1939.’ Thoroughly intrigued, the newly orphaned Jacoby looks upon this opportunity to join Claire at this disastrous stage in his career as the hand of fate at work. With him, we join Claire on her research trips, as she travels the countryside meeting people from all walks of life. These experiences give the reader a wonderful introduction into the food and culture of this part of Italy, and a very entertaining look into the mentality of the Italian males’ mind, regarding women. However, this story is primarily Jacoby’s adventure, and left to his own devices, he finally tracks down a Hotel Floria-Zanobini, which he discovers is run by another expat American, the eccentric Bill. When he shows Bill his picture, its story begins to unfold, and an excited Jacoby finds himself beginning an incredible adventure, with Bill showing him the Italy he has become part of in the previous 35 years. Together the friends set out on a mission to track down the mysterious lady in the photograph and discover the link she has with Jacoby. 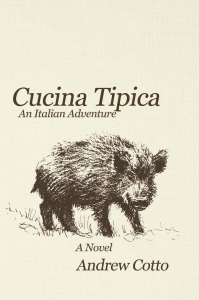 Encounters with wild boar, incredible museums and artwork, wonderful buildings, and the marvellous traditional recipes, wines, and experiences, this story has it all. The author brings Florence and the countryside surrounding it to life, as with Jacoby his readers embark on a fantastic voyage of discovery of the beautiful experiences this country has to offer. Whilst throughout the story the tumultuous love story between Jacoby and Claire rides a roller coaster, helped in no mean way by Claire’s outrageous cousin Dolores. Whether you love Italy, dream of visiting it one day (like myself) or just want to enjoy an incredibly enjoyable book set in a beautiful part of the world, I thoroughly recommend this story as the best I have ever read!